This entry was posted in Pic of the Day and tagged rude behavior. Bookmark the permalink. I love the sticker. Where can I get one? I was thinking….when did rudeness arrive in town? Thoughts? We spend time in Florida and it’s amazing how friendly everyone we meet is. 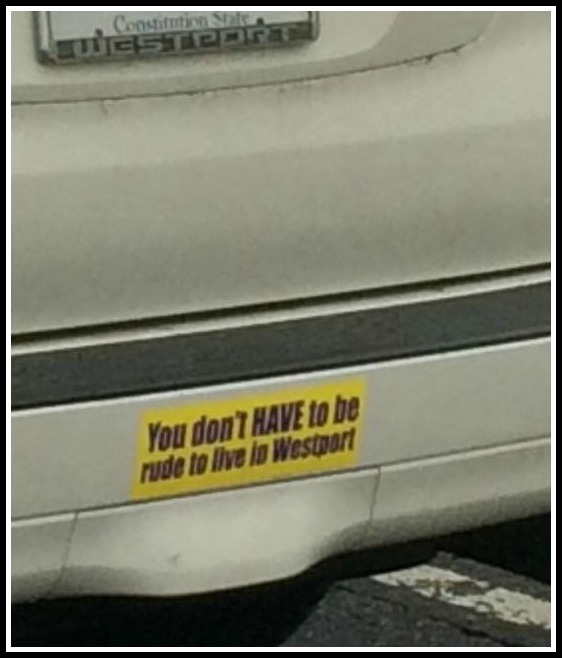 It’s not just Westport. It’s a good question. How can any one of us make the change or what can we do collectively? My guess is things significantly changed around the time when the Gap arrived and Kleins departed downtown along with most Westporters. Clearly you haven’t visited The Gap owned store that I work at on Main Street! Many of my fellow coworkers are longtime Westport residents, they volunteer in our schools, participate in local charitable organizations, pay Westport taxes and help make Westport the wonderful town that it is. The notion that our Main Street stores are staffed entirely by non Westport residents is just wrong. S & S!! I’m glad someone finally got a photo of it.